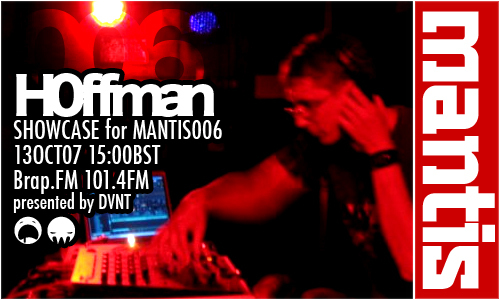 Recording a rare techno mix for Mantis Radio the talent behind the Fabric anthem Everybody, in session for our 6th broadcast: Hoffman. And for this we presented H0ffman from Unstable Label going back to his techno roots to give us a 3 deck boshathon. Ian Ford aka H0ffman is know to most of the breakbeat scene as the talent behind the Fabric anthem Everybody (Unstable) and has a score of remixes and unofficial techno booties under his wing. These days he is to be found behind the decks pushing the tearout breaks sound, but it wasn’t always like this. For many years H0ffman could be found as resident techno DJ at Freedom Sound at Enzos Nightclub, where he commanded a following due to his exceptional 3 deck techno skills. Easily up there with the best of them. Apologies for the microphone issues. DVNT, still on the solo hosting gave up some right freshness, including: wee DJs, Burial (again), Drift, Scorn, King Cannibal, DJ Godfather, Distance remixed by Vex’d. As well as some classics in the shape of Plastikman, Jeff Mills, Bad Company and Nathan Fake.